Product #21320 | SKU 30923 | 0.0 (no ratings yet) Thanks for your rating! A deposit of $60.00 is required for this pre-order. 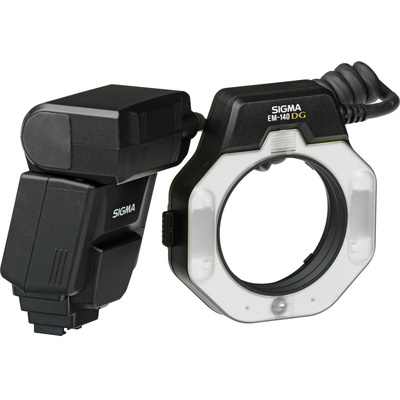 The Sigma EM-140 DG Ring Flash for Nikon AF cameras is ideal for photographing subjects in fine detail - close-up photography - and is extremely effective for scientific and medical applications. Dual flash tubes can fire simultaneously or separately. Using only one flashtube creates modelling, which can give a three-dimensional feeling to the subject. The Modelling Flash function makes it possible to check for reflections and shadows before actually taking the flash picture. A wireless flash function is also available, where the EM-140 DG is used as master and the EF-500 DG Super as a slave unit for creating fine shadow details. High-Speed Synchro functions are also available for advanced flash photography. 55mm and 62mm adapter rings are included with the flash; 52mm, 67mm, 72mm and 77mm adapters are sold separately.